Fans of Toothless and Hiccup will be delighted to know that there’s a whole How To Train Your Dragon themed land at Dubai’s Motiongate Theme Park! The land is part of the park’s Dreamworks Zone. It currently has 3 awesome rides which let you experience life with the Vikings and their Dragon friends! Soar through the skies with Hiccup, Toothless, Astrid and Stormfly on an exhilarating journey to the Forbidden Isles! Hold on tight as you fly through enthralling caves over the Great Hall and the village of Berk, on Motiongate’s most immersive and complex attraction. Dragon Gliders is the first ride of its kind in the region, with a programmable Inverted Powered Coaster system, as well as the unique ability to be stopped, sped up and slowed down, so you have the chance to focus on the most scenic and important parts of the ride! Hold onto your seats as the mischievous Viking twins, Ruffnut and Tuffnut, hijack a Viking ship for a thrilling rogue adventure. 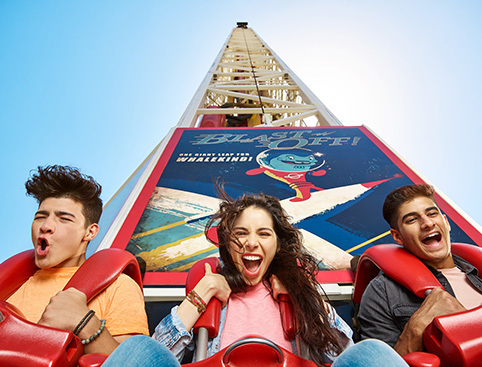 This swinging ride starts smoothly enough, but don’t be fooled – you’ll be feeling totally weightless by the end! Little ones can unleash their Viking spirit on-board these waterlogged ships in Berk’s harbour. Complete with crawl netting, dragons and water guns, kids can shoot at targets from the vessel and splash to their heart’s content. This shop is absolute heaven for fans of How To Train Your Dragon, with everything dragon-related you could wish for! Show off your Viking spirit with helmets, shields, swords, bags, as well as adorable Night-Fury notebooks, mugs and plush dragons aplenty!